I recently acquired an almost full set of Busy Bears of Hippity Hollow which I would like to trade for other toys or sell. Coffee Cafe - incomplete. Missing the coffee pot top but has bear (scuffed nose) and little table thing. I have no freakin' clue how to make the slideshow actually, you know, slide on this page without having to click it and go to photobucket. Because I am in Australia it's better for me to work out a trade than sell. Hey mouse Do you happen to have the tiny little rocking horse that goes with the My Home? It says complete but missing the bear on your post but I don't see it in the pics so I wanted to ask. That's the last piece I am missing to have the complete set! I do have a foreign rocking horse but it's a different color than the US version. Hi - I just went by (your!) pictures on GOTD. There were other pieces but I didn't know they came with these - I have a little yellow car, little yellow rocking horse and also a little yellow trolley doo-dad. I can take photos and I'll upload them. 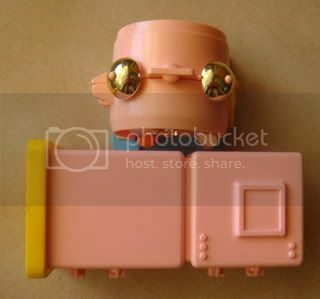 I thought the little 'toy' accessories might be koeda chan or something because they have Japan written, I just hadn't got around to photographing them for I.D. That would be great! I would love to get the rocking horse and I am sure I have something I could trade for it. I have some Li'l Litters, some tiny dogs that I think are the Pound Puppies, LPS stuff.... or I can always buy it too! I may also be interested in the pink stereo shop as mine is a bit orange-ish. Yours looks still pretty pink from the photos? Thanks! That would be super! It's the stereo shop I would be interested in most though (along with the rocking horse), not the alarm clock. It's the 2-story one that's like a refrigerator! Sorry I've been sick the past few days - will take photos a.s.a.p. The rocking horse is in excellent condition. Did it comes with a Japan only version of the playset or something? 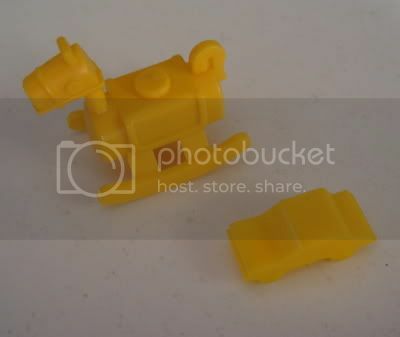 The car looks to be the same type of thing as the rocking horse so Im wondering if it came with these sets as well. Thanks so much! I would love to work a trade with you for the little yellow rocking horse and then the pink stereo house with the little desk and bear. I'll get some pics of my tinier items and see what I can tempt you with! The little yellow car I have not seen in any photos of Busy Bears from the US or other countries but it does seem to be the same color and type of plastic. May be a Koeda Chan thing as you are guessing? 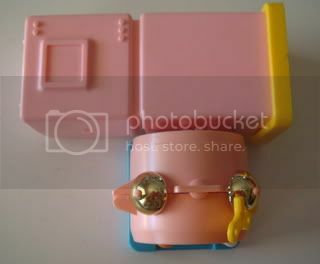 The yellow rocking horse came with the US sets and a pink version came with the Spanish versions. I am not sure about the ones released in Brazil though? Sorry for the delay! I kept getting a down for maintenance when I tried to come back and PM you! I'm sending a message now with some links and pics so we can work out a trade!